On occasion of International women’s day on 8.3.18, Jyeshtha Nagrik Sangh , Panvel organised a lecture on health for its 200 members. 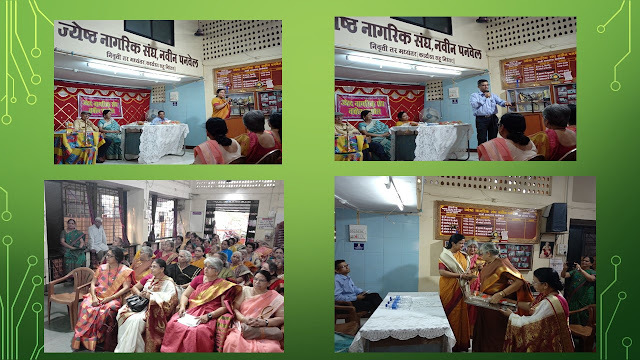 Dr Himani Gupta-Gynaecologist from Kharghar, Navi Mumbai was the chief guest. She talked about menopausal health, prevention of cervical cancer via vaccine, early detection of breast cancer by monthly self-breast examination and mammography. Dr Parag Kalan , General Physician from Panvel and eminent leader of Landmark Worldwide Breakthrough Technologies, spoke about holistic approach towards health, happiness and satisfaction.